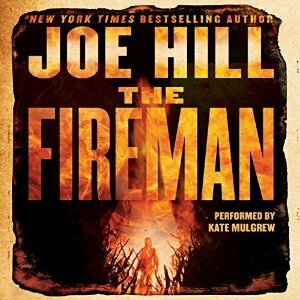 I bought The Fireman audiobook, by Joe Hill last year after devouring NOS42A and then it sat as my TBR pile demanded my attention. From the very first chapter, Hill grabbed me. This brilliant original story reminded me of early Stephen King and Mira Grant’s Parasite series. If you haven’t tried Hill I encourage you to do so. When the HoHoHo Readathon rolled around again, I was looking for a book with a winter setting, and much to my joy fellow book lovers assured me parts of the story took place in winter. Weird book for a holiday readathon, but I love horror, mysteries, and thrillers as cold weather sets in. I loved every freakin’ moment of this twenty-two-hour audio narrated by the impressively talented Kate Mulgrew. In this post-apocalyptic horror, the world has fallen after a deadly virus doctor’s termed Draco Incendia Trychophyton. Commonly referred to as Dragonscale, a highly contagious, deadly spore that marks its hosts with beautiful black and gold marks across their bodies—before causing them to burst into flames. Nice right? When we enter the story millions are already affected and hope seems lost. Hill is a masterful storyteller and he vividly brings this world and contagion to life as he introduces our protagonist, Harper Grayson. Harper is a young, married school nurse who adores Mary Poppins. As the story unfolds, schools are shut down and Harper despite the risk answers the call to help at the local hospital. Here she first meets the Fireman. He brings a young boy into the oversized hospital. A catastrophe at the hospital will change everything when Harper discovers the first signs of Dragonscale. Holy shitake mushrooms can Hill weave a story. He made events feel completely realistic from an overall worldview to the daily crumbling of Harper’s little world. We learn a lot about Dragonscale thanks to Harper’s time at the hospital, including the fact that the womb seems to protect the unborn child from the infection, and that a child was successfully delivered before the mother burst into flames. Harper and her husband made a pact to end it if they became infected and when scales begin appearing on him he wants to carry through with it. Only Harper is pregnant and that simply will not do. Harper is determined to carry her baby to term. As we spiral into madness, Harper is forced to run and fate has her crossing paths once again with the Fireman. The tale that unfolds was original, complex and addictive as we find ourselves amongst people living and controlling Dragonscale. 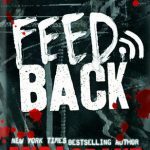 A combination of horror, science-fiction, and psychological thriller I could not stop listening. Whether you listen to Hill or read his works you’ll find his stories to be well paced, addictive and thought-provoking. He realistically captured humanities response to fear, change, and our desire to survive. The community Harper soon finds herself in, takes on an almost cult-like feel as the Dragonscale worked its way through its host. Danger, betrayal, and searches for provisions added suspense. The characters are unique, well developed, complex and Hill highlighted their strengths and weaknesses. Harper is a powerful, level-headed protagonist who I came to admire. The Fireman while a bit of a mystery emulates the aspects one expects from a fireman from strength to a desire to save lives. From Harper’s descriptions of him, I think you’ll find him easy on the eyes. As we get to know the characters, even secondary ones we begin to feel part of the group and root for their survival. The author does a good job of giving us mundane moments, tender moments and a touch of normalcy reminding us that the world does go on, even as madness descends. Kate Mulgrew narrates and does so brilliantly. She nailed the voice of Harper and the Fireman from their nuances to fears. We meet quite a few characters and she managed to give them all a unique voice. At over twenty-two hours, it was delightful to immediately recognize a character from the pitch of their voice. Hill gave us plenty of villains including an overzealous hunter, mad husband, and power-seeking opportunists. He wove fear, horror, and heroism into the tale as he developed characters, and made Dragonscale a living breathing thing. Have you ever looked at a virus under a microscope? Some of them are beautiful and Hill shows us all sides of this fire-breathing virus. He will make you think and perhaps wonder if somewhere beneath the Earth’s surface, this virus lies dormant waiting to strike. I did not want The Fireman to end but appreciated how Hill wrapped this tale up. This is one I will enjoy again and of course, I immediately grabbed another of his earlier works on audio. 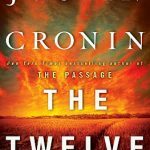 This one is a keeper and one I recommend for fans of science fiction, horror, post-apocalyptic tales. I have The Fireman sitting on my nightstand, but I’m daunted by big books and rarely have the sit-down time to get through a tome that long! I’d prefer to listen on audio, so I may need to do that. It sounds great!! I’m so happy you enjoyed this book. I sure did. But some of my friends didn’t like it much. I briefly skimmed through your review because The Fireman is on my immediate TBR list, but I am glad that you enjoyed this read. I think Joe Hill might convert me to the thriller genre like Anne Bishop for me with fantasy. If I hadn’t already read this book, I would be one clicking it for sure based on your review. I really loved this book. I totally agree the style was a lot like early Stephen King. Fantastic review! Wow! Five Caffeinated Mugs!! Awesome!!! Thanks for the post. I’m so happy to positive reviews on this one. I was so disappointed in the father/son collaboration. Excellent review! OMG, Kate Mulgrew narrates it? I love her! 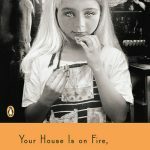 And even though I don’t typically read horror, you’ve convinced me that I need to read The Fireman! Well dang, that sounds so good. I’ve been eying this one and thinking it might be a great choice for a debut into his books. I love how you describe how the disease affects various aspects of people. The heroine sounds great and I do like Kate Mulgrew’s voice. I haven’t ever read a very good post-apocalyptic story but this one sounds captivating! Science fiction, horror and a psychological thriller all in one! Count me in. The characters sound amazing too! I never read the author’s work, but after reading your review I am thinking I should get this book. Adding to my wishlist. Dang! Another amazing review Kim. I should really start reading from Joe Hill again. I loved this story too. I read it last year and just fell in love. I need to see what Hill book I want to try next. This one and NOS4A2 are still my favorites. I heard so many amazing things about the author but I confess that I haven’t read any of the books even if I know that I really should do that!